I was asked "what's my comics pull list look like?" Today I was talking to a few people on G+ and we were talking about running a superhero game at the next North Texas RPGCON, DC Heroes instantly came to mind when I thought about it. I mean, I grew up playing the heck out of the game! I loved it to pieces! Then we got into speaking about what comics might I be inspired by to use while running the game and I said I wasn't sure, I read so many. Mostly DC as you can see. Some folks have been asking what's next for Mazes & Perils.. here's a quick look..
Folks have been asking me, what's next now that the new book is out and we all have it? Well there is a few things that are in layout phase right now, such as adventures. While I wasn't able to spend upwards of thousands of dollars (yes some folks did during the auctions to get amazing ORIGINAL pieces of art) I did spend a little and grab a few books including winning a silent auction for the Scarred Lands (sealed) gazetteer. Hey its awesome for grabbing ideas for my games! But I had a great time gaming and podcasting with +Erik Tenkar! Special thanks goes out to DM +Glen Hallstrom for allowing me a spot in his Gangbusters game. I never got to play the game as a kid (I owned it) and finally I was able to play in a quality game. I look forward to a new edition of the game coming out! 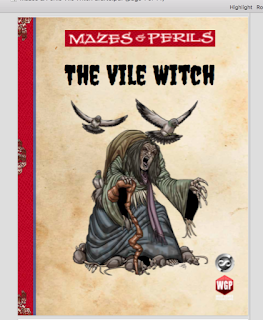 Mazes & Perils Deluxe hits #1 on RPGNOW! Thank you everyone! As you can see by the picture above, in less then 12 hours M&Pde has hit #1 on RPGNOW's hottest titles today! Thanks to all the folks who decided to take a look at the book! Let's keep it going as the sale goes on all weekend long! So if you are still on the fence about it, why not pick it up, its only a $1. After Sunday it goes back to its normal price of $7.99!